Yesterday I met the boy we sponsor through Compassion. All this time we thought his name was Mukanga Dissan, but it turns out that Dissan is actually his first name. We all met at a well-known Chinese food restaurant (yes, I came to Africa to eat Chinese food), and the Compassion workers brought in the children. Dissan looked a little nervous, until I approached him. He saw the soccer ball I was carrying for him, and his face broke into a smile so big it could light up this hemisphere. He couldn’t even bring himself to put down the soccer ball for the first 30 minutes. We sat down to eat, and his eyes were as wide as saucers. This was not only his first visit to the city, it was his first time to eat at a restaurant. He’s nine years old. We began to go through the backpack full of goodies I brought from home. His eyes nearly came out of his head. He couldn’t believe the clothes (they were a perfect fit) and his mouth hung open at the $1 solar-powered calculator. He must have said “thank you” to me a thousand times. The Compassion worker from his project in the village made the four-hour drive with him, and she served as our interpreter. She and Dissan together told me his story. He lives in the village, in a mud hut. Both his parents died last year, and the relative he was sent to live with is very sick. So is his six-year-old brother (Dissan is healthy). Because it has rained so much in Uganda the last few months, the front wall of their hut has washed away. This boy, this precious boy with the golden smile, does not have parents, and he does not even have four walls. He could not believe the constant flow of food brought out to us (it was served in courses). He devoured everything in front of him, including four egg rolls and two bottles of soda (he was amazed that the waiter brought him a second one). After lunch, we kicked around the soccer ball in the yard of the restaurant—the boy has a wicked strong kick. I showed him a picture of my children and he asked me when he could meet them. Parting was terribly hard, especially now that I’ve seen mud huts in the villages and I know what he’s returning to. The interpreter helped me tell him that I love him, and that my family prays for him every night. He told me that he’s praying for us too. Imagine. I told him that I promised we would continue to sponsor him through Compassion as long as he needs us, until he’s an adult. I gave him a long momma hug, which he eagerly returned. I whispered in his ear the blessing I say over my own kids before they get on the bus each morning: May the Lord bless you and keep you, may He make His face to shine upon you, may He be gracious unto you and grant you His peace. And when he was gone, I hid my face in Sophie’s shoulder and wept. When you sponsor a Compassion child, it is not a “symbolic” sponsorship. Your money is not going into some generic slush fund and doled out to a random group of children. There is only one Dissan, and he is ours. If we didn’t sponsor him, he wouldn’t have a sponsor unless someone else signed up. If you’re a child sponsor, and you want to visit your child in his home country, then they will arrange it. Because there’s only one of you, and there’s only one of them. Have you been reading the blog posts this week? Have you been thinking about sponsoring a child? Somewhere, right now, in a slum in Uganda or a shack in Ecuador or a mud hut in Rwanda, there is a child whose life could be radically, completely altered by your willingness to make the tiniest sacrifice. Please, just take one of these kids into your heart. They won’t be the only ones whose lives are changed. You won’t ever be the same, either. Oh, that made me cry. God bless you and your family. Okay, so now I’m just sitting at my desk at work crying… That is just so beautiful that you could bring such sunshine into a child’s life that is full of stormy days. You are a very blessed person! Thank YOU for what you do for others. Oh my word. Crying….and headed off to write my sponsored child a letter. Thank you! Thanks, Shannon. We became sponsors of a little girl in Ecuador about a year ago. Reading your experience of meeting Dissan made me so thankful we are able to help Brigitte. I know going to Africa is out of your comfort zone. Thanks for doing it and for sharing your experience with us! God bless you and Dissan! Thank you for taking this leap of faith with this trip, and thank you for encouraging others to sponsor children. Our family chose to sponsor Fred from Uganda last night. It’s the best Valentine’s gift we’ve ever received. Shannon – I know I’ve told you this before, but as I read your last few entries, weeping, again, I am consumed by the powerful confirmation that God has truly gifted you as a writer. The images are vivid in my mind, even though there are few pictures. What an absolute blessing that you have been granted to actually meet the child you are sponsoring, speak with him, laugh with him, play with him, pray for him, and bless him. I hope to have the same blessing one day, too. You and Sophie are killing me these days! I haven’t read any of your posts about this trip without tears. God is definitely working for the good of these children through your heart, mind and words. At first I wondered what good it did for Compassion to drag bloggers halfway across the world to see Uganda. Now, I think that God moves in mysterious ways and that you are all being used for the greater glory of God. I also plan to sponsor a child through Compassion. This is solely because I see through your and Sophie’s blogs that the money is used to help real children. I also want to add, that we decided to sponsor a child as our family Valentine’s day gift, and I’ve encouraged my readers to do the same. Thank you, friend, for facing your fears, and following God’s prompting to do his will! Wow, what an incredible experience. I can’t imagine meeting my sponsor child. Your child’s story broke my heart. What an amazing story….what an amazing trip…be safe on your return. Thank you Shannon – Thank you. I signed up to sponsor Mary from Uganda through Compassion today. I have considered doing this for awhile now. Your post was the extra push I needed. Blessings to you and the team in Uganda now. And to your families who are at home missing you while you are doing some amazing once in a lifetime things. Stop. Just stop. My throat hurts from trying to hold back the tears.I posted a comment on BooMama’s blog yesterday that we had cancelled Netflix and sponsered a little three year old Ugandan boy. We gave up a fraction of our entertainment to feed a child. Thanks for sharing your journey with everyone. We adopted a little boy a while back and hope to adopt a new child soon. That is amazing that you actually met the child you sponsor.I need to talk to my husband about sponsoring a child. Thank you for sharing your gift of writing to help tell these stories. I have always wanted to do something through a charity, but you never know if you can trust that what you are doing is really helping – I will be sharing your posts with my husband and hope to have our own Dissan too. Thank you for giving of yourself! Wow, now I’m crying. My husband and I sponsored our very own child last night, Okalany, from Uganda. Seeing these children first hand from your blog makes is so real. I can’t wait to start supporting this precious child. Keep loving on those boys and girls. I have really enjoyed reading about your adventures in Africa. Really puts life back home in to perspective! I have a question for you – if I wanted to sponsor a child but am not a religious person at all – would sponsoring one via Compassion be the right move? Every child in need deserves a sponsor but if the sponsor does not have the same religious beliefs – does that take away from the experience. I am having a hard time finding a highly rated charity that is not religiously motivated. Is there such a thing out there?! I watched the video on Carlos’ blog this morning of you meeting him. I cried through the whole thing. And then I come to your blog and start crying again cause you have such a way with words. PS – It was SOOO neat to see you in live action and hear your voice on the video. After reading your blog for years, it was nice to hear your voice! As others have said…this made me cry. It is so special that you were able to visit Dissan. I just love the picture, and I know you will cherish that and your moments together forever! What an honor to meet that little boy, Shannon. My eyes are filled with tears, and my heart is filled with hope. We sponsor three children right now (one through Compassion, two via other nonprofits we support and love) — and it’s one of my new life goals to meet them all in person. Okay, I confess, I’m a lookie-loo. I read often but now daily on this trip. Today’s post required Kleenex when you met your child. Praise God for this wonderful opportunity for you all. I have a Compassion child in Ethiopia and two natural kids here in Seattle. Because of this trip I have linked to several of the blogs to cross-reference your pictures, video and posts. What a wonderful thing God is doing here. We can see so clearly what you are seeing there and are feeling the impact of the lives that are being changed over there. Read your post, then hopped over and watched the video that Carlos posted of your meeting with Dissan. Two tissues later I’m able to post a comment. Wow. I commented on Boomama’s this morning that I’ve been following your trip and telling my husband about it all week. We decided earlier in the week to sponsor a child. Wed. night he told me we are going to sponsor 3 – one for each of our own children. We’re planning to sit down with the computer and our 4.5 year old & 3 year old and have them help us choose the children. Thank you for reminding me to look beyond my own front door. Ps. Is that an ARKANSAS RAZORBACKS! hat I see on that child?! Whoo Pig! Oh thank you so much for this. I posted this at Sophie’s place but we have sponsered a girl named Evelin for the last 6 years who just graduated this year. This trip has brought that experience into a whole new light for me. Now I wish I could sponser 5 more. God bless you for stepping out of your comfort zone and taking it. I just wanted to tell you that my family and I have also decided to sponsor a Compassion child- a sweet little 3 year old in Ecuador named Baltazar. Your blogging this week has shown me that we can actually make a difference in his life and I am so excited to get our sponsorship packet. This has been the most fulfilling Valentine’s Day that I can remember- really showing love to someone else in need. Typing through tears is hard. I’ve been anxiously waiting for you to meet him so we could hear about it too. I can’t imagine what it must be like to meet this boy and for you to meet him. I don’t have any words…you said them all anyway but I just think it’s so amazing. I imagine a very small number of sponsored children actually get to meet their sponsor. How special for him! and for you! We used to sponsor a child through World Vision but he no longer needed our help. Finances are never abundant for us but we hope to again someday be able to help a child in need. What a blessing to be able to meet him and take those pictures and memories back to your family! God is definitely letting you in on a huge thing and I am so happy that you got to have such a wonderful experience. I am weeping as I read this! God Bless you and Sophie and all the rest for going out and being messengers for Compassion! It is rare for blog words to move me to tears. This meeting…you bringing your story to life…did just that. I realized I’m one in a sea of others who were so moved. …and so, “now what” is the question I’m asking myself. What an amazing…memorable day for all of you. Tears are streaming down my face. After reading this post, my family will sign up to sponsor a child. Thanks for the wonderful picture. I’m so glad you got to meet Dissan face to face. I’m also glad you explained that the money does go to THAT child. I’ve always wondered. The tears…they are a-streamin’. Thanks for painting that sweet picture for us in words and images. And thanks for being there for Dissan. Love it and love you. Shannon, I was doing ok, until you wrote that he ws praying for you–lost it. What a sweet boy, in the midst of his trials and desolation, he reaches out to comfort you! Lives are being changed through your blog, and the blogs of many others. Thank you for your servant heart. My husband and I have sponsored a little girl for a year, and it is with shame that I admit we have never written to her, or sent her anything, or even prayed for her. Our bank account is drafted each month for the amount we pledged to Compassion. This post has convicted me to repent and change our awful habit starting now. Shannon, I’m a frequent reader but very rarely comment. I’m so glad you finally got to meet Dissan. I saw the video Carlos posted and cried, just as I cried when I read your post. What an amazing thing you and the rest of the team are doing! And from one Arkansan to another, I loved that you gave him the Razorback hat!! I just finished reading your post and after drying my eyes, I signed up to sponsor a little boy who just turned four in Ethiopia. His name is Bereket Tofik and he is mine. I can’t wait to put his picture on my fridg, help my children write him a letter, pray over him and maybe one day visit. (My sister is in the process of adopting a baby girl from Ethiopia. It seemed fitting to sponsor a child who lives in the same country as my future niece. I just wanted to say thank you. What you are doing is working. Shannon, thank you for sharing. What power your words contained. I got emotional just reading this post. I can’t imagine what your time with Dissan did for him. He must have felt like the most important person in the world at that moment. I know the time with him was special for you too and gave you a whole new perspective on your family’s sponsorship of him. Bless you and your family. Thank you for getting out of your comfort zone. In hind sight I’m sure you’ll say it was well worth it! Ack! Now I can hardly see through the tears to even comment! What an incredible blessing and opportunity for you both! I don’t know that we will ever have the opportunity to meet our child, but his pictures are plastered on the front of our fridge and his name is spoken in our house on a daily basis! He is truly a part of our family! Wow! That was so simple, and yet so powerful. I can’t help but cry! I am praying for your little guy. We have a little 8 year old girl through Compassion, Mwanne, from Tanzania. I only hope that we will be able to meet her someday because she really is so special to us. She is the same age as our girls, and we hope to sponser a little boy close to our little boy’s age too someday soon. Thank you for this post on your blog. I hope and pray that it will touch many more people and change the lives of many more helpless little children around the world. Okay, that did it. We are definitely going to sponsor a child — thanks to you and Boomama. I absolutely broke down when he said he prays for you. We are so blessed. Thanks for going and sharing. I know it wasn’t easy. You are loving on God’s precious chidren, though,and earning lots of crowns to lay at Jesus feet when we meet him. We adopted 3 siblings from Liberia. They came from very similar circumstances. Thank you for helping where you can. These children are tremendous blessings! We sponser a boy, named George, to go to school in Liberia. It is a school run by our adoptions agency. http://www.planlovingadoptions.org For $25/month you can sponser a child to go to school and receive a meal each day. For many, this is the only meal they receive. I’d encourage this cause also. Also, like your cause, all funds go entirely to the child. Africa is in need of more families like yours. Thank you. I’ve sponsored a little boy in Tanzania for several years now (through another relief organization). Every month, my $30 is automatically deducted from my checking account, and to be honest, I’ve given it little thought beyond that. I tried to write him once, but I couldn’t figure out what to say. Thanks for telling the story of the power of child sponsorship, not just in terms of what it does for the child, but the way it changes you. Thanks for the reminder that this little boy really is a part of my family. I’ll be writing that letter now. I don’t think you can look at that beautiful smile and read the words you wrote without crying. This momma’s heart is full right now of thankfulness that you are his sponsor and that he has a future. Didn’t you want to just pack him up and bring him home? What’s one more? I have been reading the posts and just weeping. 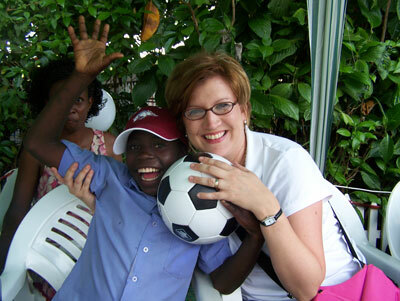 Because of you and BooMama, as of last night, there is one less sponsor-less 6 year old boy in Uganda! Thank for opening my eyes to the group Compassion and the work they do. We are very excited and blessed to be able to do this. Thank you. Gosh…I’m bawling here. I’m so moved by all the Compassion bloggers posts. I thought about the boy Basil that we sponsor from Burkina Faso (I posted about him here: http://blog.kerchners.com/2008/02/rocks-in-my-dryer-uganda-update.html). We had the same problem with his name (is that his first name or last???) I would love to go and visit him over there…I’m not sure if I could emotionally handle it though. You are so blessed to be able to meet Dissan. I sponsored a child in India through another aid organization for about eleven years. Recently, I received word that her family had moved out of the area and the organization had lost touch with them. It was very hard not to be able to say goodbye to her (though she’s now about 16), and I never had the chance to go visit her. Wow! Thank you. Thank you for sponsoring him. Thank you for going to Africa to visit him. Thank you for sharing the story! Amazing. That, so, totally blessed my heart. Thanks for bringing that back to us. Simply beautiful… I have cried so much over how precious that meeting was. Our financial situation isn’t the best at the moment or I would sign up to sponser a sweet child immediately. Please know that your visit and words are changing lives regardless, and has truly touched my heart. My heart is so full and I can’t wait to have the opportunity to help a child myself. Like everyone else, I am crying. What an experience. How hard to let him go. He’s already so much a part of your family. Because of you and Sophie, our family has decided to sponsor a little boy. I hope one day, we can meet him, too. Thank you for your obedience to God! You mentioned that we could visit our child. I couldn’t find any info about that on Compassion’s site. Do you know where I should look? Or maybe just e-mail them? I would looooove to take my family! crying, crying, crying. i’m so glad he has you, and you got to meet him and hug him and bless him. I watched the video of your meeting this morning on Carlos blog–it was so moving. I had to come back this afternoon to see if you had posted about it. Your words are beautifully descriptive as always. What a blessing to put your arms around him and he you. I’m sure it is something neither of your hearts will ever forget. That is a beautiful picture. My heart is so full and I’m very humbled, broken. Thanks for sharing. Shannon, I have tears rolling down my face. We just signed up two nights ago to sponsor a little 9-year-old boy named Samaul. I would love to think that one day I might get to meet him. Thank you for sharing. Every time I have read your blog entries from Uganda I have ended up weeping. Not trickling tears, but deep, grief-stricken sobs for the plight of these children. All of the bloggers are making such a huge difference by getting these stories out. Shannon, your courage in the face of your fears inspires me… and God is using your obedience mightily. Because of all of your work God has led me to sponsor a child. I am now excitedly awaiting the arrival of the newest member of my family! I cannot imagine trying to process all that you have had to do in the last several days. God’s sweet, sweet hand is just all over each of you! Thrilled that you met that precious boy, Dissan. We are all changed through each of you. And….I’m so thankful that God gave me the strength to sponsor our first child. You and the others “did it” for me and I’m forever grateful. Oh my word…he is so beautiful and I am just THRILLED to pieces that you got to touch him, hold him, and pour out so much love on that little guy. I know it did your heart a world of good, too. Praise the Lord for that meeting. Praise the Lord!! Thanks for this blog post which has opened my eyes. When I saw Keely’s post with the picture, I knew I had to sponsor a girl. So Olphine Deranne from Haiti is my girl – she’s 8 years old and already she has made my day better. thank you for sharing your experiences. As the tears run down my face, I am reminded there is good… we can make a difference. This has been the most powerful post of the lot for me and I’ve been reading everyone’s blog. I sponsor four kids through Compassion (I don’t have kids of my own) and I so hope to meet them one day. Each one is so precious to me. To those who have never written your child, I just want to encourage you that it couldn’t be easier! You can do it online at Compassion’s site. You will be so blessed by the change in their letters when you do. We have sponsored Kambadu from Tanzania for the past year and a half. Seeing your testimony on this blog about Uganda has made us realise even more what a difference child sponsorship can make. We hope one day to visit Kambadu in Tanzania. And we love Compassion’s true links with local churches and local people. I have been not reading your or Sophie’s posts because they upset me so much. I finally sat down tonight and caught up and can’t stop crying. My seven year old son just helped me pick out a little boy from Uganda to sponsor. Thank you. I’m so glad you got to meet him finally. I hope one day your kids get to meet him too. Shannon, I sobbed out loud like a baby trying to read this post with DP today. How precious to have met Dissan and how heart-wrenching to have to leave him behind. I am so, so proud of you, dear friend. You have allowed God to stretch you in so many ways, being willing to face what seemed insurmountable fears and with grace and a smile on your face. We added precious Juana from Guatemala to our family today as a gift for all of us. I cannot tell you how much it means to have read your posts this week and to now be a small part of the solution for one family. Thank you a million times for all you’ve shared. Reading this post and watching the video of your meeting with Dissan have been unspeakably, blessedly moving. I was sobbing so hard the first time I watched the video that I had to come back later to post a comment. God’s grace and power have been so evident through this trip. Thank you so very much for sharing with us. You and all the other bloggers are in my prayers. How do you leave without just packing that little boy up in your suitcase and bringing him home??? I havent commented in awhile, but I have been reading. I have been crying! its such a wonderful thing that you, sophie and others are able to do! its a wonderful thing for these children, to be helped and to meet you guys. I cry when I see the pictures, mostly sad cries, cries to imagine my own children if they were in a situation like that, imaginging these kids, that they are use to this, this is their way of living.. and then some happy tears, happy there are so many compasionate people to help, and happy that you and sophie are meeting the children you sponsor. TEARS! Thank you again and again! Lastnight I looked through all the kids pics to sponsor. But decided to wait until my hubby comes home tonight so we can choose a child together. Praying for you, your team, and the wonderful people you are meeting every day! We sponsor little Luisa from Colombia, and exchange letters with her often. She always writes at the end of her letters that she prays for our family and asks that God blesses us each day. I cry every time I read her little words. We sent her stickers (because they are flat and will fit in the envelope) and she used them to decorate her next letter to us. She wanted to share them with us. What a baby doll. We would love to meet her in person! Your post today confirms that I did the right thing last night when I picked a little girl from Brazil to sponsor. I picked one that had a ‘heart’ beside her name (I think that means she’s been waiting a long time) and she will become our ‘third grand-daughter’, joining the 2 biological ones we love so dearly. I picked Brazil because we are going there next week on an agricultural tour and I know I will think of her every single day. Joining a Compassion tour to visit her would be so wonderful someday. You have done such an amazing thing this week – sharing the stories and desire to help. I read Shaun’s blog about selling his house today and the wealth we take for granted in NA – oh, so true. Thank you for doing this trip and for sharing from your heart. I simply can’t find the words to express how God has worked through you. Thank you from the bottom of my heart! Shannon, I signed up to sponsor a child today! A precious little 5-year old girl in Rwuanda named Muhoza who’d been waiting for a while. At some point post-trip, can you please report back to us how many kids were sponsored while you guys are there? I can only begin to imagine how many lives are being changed RIGHT NOW. God is good and faithful and working through you and all of the other bloggers there. Congratulations on getting to go to Africa & blogging so beautifully about it. I am going to be completely honest here & say that I had not planned on reading the posts because I did not think my heart could take it. Curiosity got the better of me. You & Sophie are doing a wonderful job presenting the children’s lives in Africa to us, although you’ve made me cry. I have never ever planned on sponsoring a child because I have never believed that the money would actually go to the child, & the thought of that breaks my heart. I am now considering sponsorship if the money goes completely to the child. I pray you all continue to have a safe trip. Wow! I’m crying. And praying…for you…for your trip…for the children…for the one that I’m sponsoring…for all the Americans who are not sponsoring anyone…for all of us. What a wonderful experience you’re having. Thanks for sharing it. I have a curiosity question: how is the child being sponsored protected from theft, for example, once he goes back home? this trip has brought me to tears…thanks for sharing. Well said. Sponsoring a child is a small thing to most of us financially, but a HUGE thing in Africa. Although my family sponsors two children through World Vision, last year I had the opportunity to visit churches in Ethiopia that had a lot of Compassion children. Often that sponsored child was the only child in the family who went to school. And the funds helped to feed the entire family. We also visited a school out in the bush. I had brought a large bag of pencils with me, a gift from some women in my home church. Pencils, mind you. Regular lead pencils that our kids lose all the time. When I presented this bag of 30 – 40 pencils to the teacher, the kids eyes were probably as wide as your little Dissan’s. They were so happy to get PENCILS. Very, very humbling. God bless you for sponsoring that child. I can see that this trip has already changed you. We sponsor a little boy. I have not been praying for him as I should. I did not feel that he was real. Your post reminds me that Francis is a real boy and he depends on us…a little bit. There are people who have never sponsored a child before, who now are. Let’s say that again: there are people who are sponsoring a child now who never have before!!! I know you agree that if even one person would sponsor because of your trip, it would be worth it, no? (Not to mention the spiritual growth and rewards you are being able to experience) Our God is awesome!!!! The heartstrings of people are being pulled all in a good way (including mine) because of the work God is doing through you. People are being reminded that they are doing so much more than just sending a check monthly to Compassion. They are forming relationships at this moment through letter writing. I am so thankful you got to meet Dissan. I pray, I too will one day meet our Sandeep who lives in India. And just in case you are a little homesick: May the Lord bless you and keep you, may He make His face to shine upon you, may He be gracious unto you and grant you His peace. I saw a video of your meeting Dissan on Ragamuffin Soul’s blog. I couldn’t wait to read what you had to say about it. So moving! Hi Shannon — I’ve just signed up to sponsor a little girl from Ethiopia through Compassion International. She has the exact same birthdate as my daughter, and when I saw how little she has in comparison to my own child, I couldn’t help but sign up. Thanks for being part of this trip — I’m sure many of us who were once ignorant about the plight of children in poverty-stricken countries have been spurred to action by what you and Sophie have been writing. I am eagerly looking forward to receiving my sponsorship packet! My heart was overwhelmed by your post, but my irreverent head has to ask…Is that a Razorback hat on that child’s head? LOVE the razorback hat! Thanks for working so hard to keep us updated on your trip. Woo Pig Sooie! This post brought tears to my eyes and I was instantly praying for Dissan and children like him! We have recently been reading/exploring, as a family, a wonderful photographic journal called “Material World: A Global Family Portrait” by Peter Menzel. It is absolutely eye-opening to view the Texas family, and all of their possessions that can’t even fit on a 2-page photo spread, versus a family in a dirt hut in Ethiopia whose earthly belongings would fit in our outdoor shed. I highly recommend this book to every American family! We are sooo spoiled, and very often we don’t even realize it. Thanks for sharing your heart and this experience, Shannon! Thank you Shannon. I have sponsored a Compassion child for years and she has now outgrown the program. I was not good at writing to her. Compassion gave us another child from the same country and I have been sponsoring her for a few months now…however, I still have not written to her either. She has sent us one letter already. I need to make this child special. Thank you for sharing your experiences with us. Wow. I have been sponsoring a little girl named Graziele through Compassion for about a year now. She is a precious little person and your post here has renewed the yearning in my heart to let that little girl know that she matters. She lives in Brazil and I hope to visit her someday. How exciting to actually meet the children you sponsor! We sponsored a little girl in Uganda called Fiona on Valentine’s Day. Saw the beautiful video on the other blogs of you meeting – wow, still crying. Thanks for all you are all doing to raise awareness of Compassion. I am yet another one that chose on Valentine’s Day to sponsor a child. Her name is Anna and she’s 9. I can’t wait to write her a letter! I’m so grateful for your words, experiences and willingness to do this for these kids and for us. I am crying…Thank you for sharing this with us. I’ve been following all week–you and Sophie and Shaun. Just before coming here and reading this, I sponsored a child. 6 year old Darfin now has a sponsor. God has been tugging at my heart. I have no idea why I haven’t done this before, but I am proud that I am doing it now. We can’t believe we haven’t done it before, but we now are sponsoring a boy in Tanzania, thanks to you and the other bloggers. Your writing and your experiences touched us so much this week. Thank you! What an amazing boy to have such joy in spite of his circumstances! Surely he is more blessed than those with material possessions who lack appreciation. We’ve sponsored through Compassion for a number of years and have gotten teared up just from reading our child’s letters…so much love in spite of so much poverty. If I ever got to meet her, I’d definitely be sobbing like you were! Your story rings true with my own trip to Uganda last year. And yes, I cried too. Oh…I can’t stop crying. Reading your story is just so overwhelming. You are so inspirational. I’m just at a loss for words because the goodness of your heart is overflowing and I can feel it! What a BEAUTIFUL moment in time for you and Dissan! Just incredible! We sponsor through World Vision and I can’t imagine how powerful it would be to meet our child. Over the years, we have had quite a few as they often move or grow up. I would love to have met them!!! I don’t know whether Compassion insists on sponsors being Christian but I would doubt it. Sponsorship is sponsorship — it’s your love that’s needed and your money as a result of that love and wanting to help. Your post was beautiful and humbling. Thank you for sharing this part of your life with the world. I truly believe in the phrase “It’s takes a Village to raise a child”. Hopefully together, we can all come together as a village and raise these children’s spirits and give them hope. Your journey has been amazing and because of such, my husband and I have gladly welcomed (sponsored) 4 year old Muvunyi Adolphe. Country, Rwanda. It’s only been since Feb 15th, but we pray and think of him often. Thank you to you and the other bloggers for connecting us to him. Oh Shannon. Beautiful, just beautiful. You have truly touched me through this post. I may be planning a trip to India to meet up with out child. I’m am so glad you were able to meet up with Dissan. What a heart! And I mean both of you! Thank you Shannon! Thank you, for making me realize what is important. Thank you for making this trip and bringing this all back to us. The video on youtube did me in. I have wanted to sponsor a child for so long but being a SAHM I have no income. I have brought the subject to my husband before and he was not willing to sponsor at that time. I am going to show him your post and video and if that still doesn’t change his mind I will come up with the money somehow. Thank you again. Shannon, your post here along with so many of the others that I’ve read has broken my heart, made me cry many tears and finally shown me that my family needs to sponsor a child just as much as that child needs a sponsor. If you don’t mind, I’ve posted a link on my blog to this post along with the video of you meeting Dissan. Pictures really do mean a thousand words. Thank you. What a blessing that you were able to meet Dissan! You get to see first hand that your dollars are at work and that they mean something to a sweet boy like Dissan. I’m in, how can I not sponsor a child after a story like this? Thank you for sharing this wonderful experience with us. I love how God has used you through your blog to bring all of this to us. Thank you again! Oh my goodness! We are so blessed!!!!!!! My husband and I have had a hard time deciding which child to adopt. It is such a hard decision. We’ll just have to pray about it and make the decision this week! I wish I was rich like Oprah so that I could support ALL of the children! wow. You’ve touched my heart more than any church sermon ever has…and I’ve been in church my entire life! 🙂 Thank you, thank you, thank you for sharing your trip, your photos, and most importantly, these precious, precious children. It truly is a testimony to how we westerners live and just how much STUFF we could do without. That post brought me to tears. Thank you for sharing that. And what an awesome gift to get to meet your sponsor child. 🙂 You definitely reminded me of how much I have to offer a child in a foreign land. I will talk to my husband tomorrow about sponsoring a child. God Bless You for doing this.